For this month's "Maps of the Month" featurette, I wish to draw your attention to Geminiman's Mega Man VII (Super NES) maps. One of the biggest Mega Man fans is Geminiman, if you couldn't guess by his name (though his horoscope sign is Gemini as well). Since those born in June (except for the last ten days) are under the horoscope sign of Gemini, I thought it would be an appropriate month to recognize Geminiman's contributions. Besides Mega Man VII, Geminiman has also worked on Mega Man: The Wily Wars, Mega Man V, Mega Man VI, Mega Man & Bass, Mega Man X and Mega Man X 3. His work on the X series' games was instrumental in the April Fool's joke earlier this year, so he deserves credit for that too. 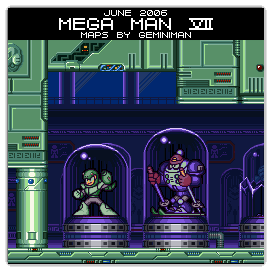 So to recognize the effort put into making these complete and classic maps, Geminiman's Mega Man VII maps will be known as VGMaps.com's Maps of the Month for June 2006. I like how you choose maps appropriate to the month. I'm a Gemini, by the way. Congratulations, Geminiman. You've made lots of great Mega Man maps. I like how you choose maps appropriate to the month. I try. I figured Geminiman was long overdue for recognition, before it dawned on me that it was the month of Gemini anyway. This is the first MotM this year from a game with a SHORT title. Geminiman also completed Mega Man V the other day, so I should remember to make a thumbnail for it on the random map sets thing on the front page. The poll for favourite Mega Man V Robot Master is today and VII's will be in two days. What's wrong with my images? It worked in another topic. You can't see the image, can you? Unless I put it on ImageShack? WTF! I can edit my post now but I'll have to edit the Maps Of The Month page when I get home. RyuMaster pretty much owns the Game Boy section, if Geminiman doesn't do it, then he might. I recall that Revned also did some of one of the Game Boy games.